"A finger smashed in a car door and a missed geology examination at the University of Utah led Wallace Stegner to a special assignment about Clarence E. Dutton, thence to John Wesley Powell, and finally in 1954 to publication of what is arguably the single best nonfiction book dealing with the American West. Beyond the Hundredth Meridian remains in print fifty-two years after its initial appearance. Not many books have survived that length of time and thrived, despite competing works on the same subject. This combination of biography, history, and environmental primer written with the flair and the technical skill of a novelist who could masterfully evoke scenes and sustain a gripping factual narrative sprang from Clarence Edward Dutton: An Appraisal. Seldom has such a classic book had such a humble beginning. Stegner was a young English instructor at the University of Utah when he produced the Dutton essay. He was ambitious and desperate for recognition, a raise (he was earning $1,700 a year), and steady employment in the Depression years. The essay contains hints, in terms of style and content, of what Stegner would eventually produce. Dutton was Stegner’s first published work of nonfiction, and it is fair to say that it lead him, in conjunction with Bernard DeVoto’s prodding, to the subject of conservation." 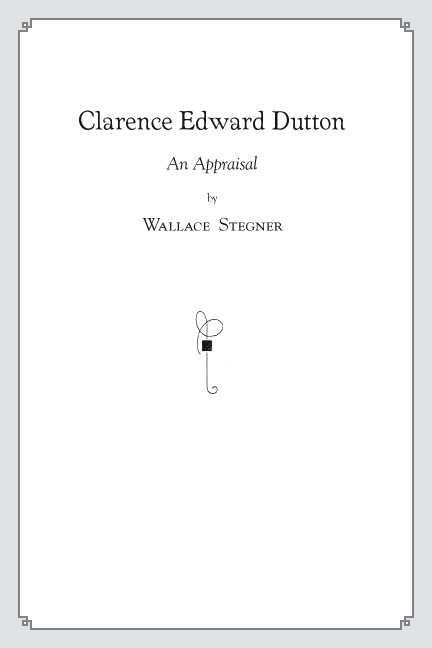 Clarence Edward Dutton: An Appraisal was first published by the University of Utah in 1936 and has since become a rarity on the antiquarian book market. It is reproduced in facsimile for this edition. Wallace Stegner (1909–1993) remains one of the most distinguished writers of the American West. He authored essays, histories, novels, and short stories and was the recipient of the Pulitzer Prize and the National Book Award.